Inscription: At top center, inscribed "23" in light brown ink by Goya; at bottom, inscribed "No puede ya con los/98 años" in black ink by Goya. Secondary Inscription: At top right corner, inscribed "21" in black ink by his son Javier. An extremely aged figure of a man hobbles along with two canes, overwhelmed by the weight of his own body. Drawn from life, the figure presents a universal image of old age, while the inscription flatly describes physical and mental frailty and hints at sexual impotence. 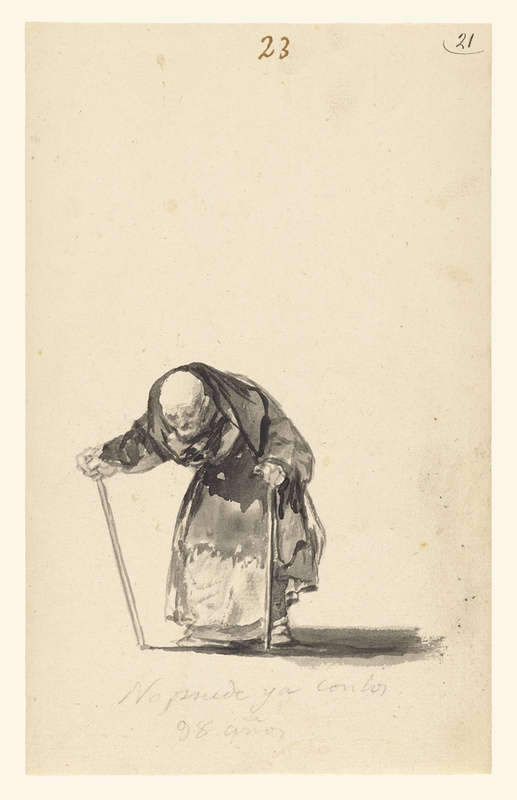 Francisco José de Goya y Lucientes made the drawing at age sixty and had himself survived a serious illness; along with several other studies of old people, he included this drawing in his now-dispersed "Album D."
For Goya, the paper played as strong a role as brush and india ink. He enhanced the old man's sense of isolation by placing him low on the page, allowing the blank background to suggest his loneliness. Blank paper evokes his bald head, and the india ink provided clean black strokes and exceptionally fine gray washes for the high dramatic contrasts Goya valued. Few of his more than a thousand known drawings are purely linear, fitting for the artist who first declared that nature contains no lines.